A bit of advice – just go with the flow when at African Paradise. From the odd, vaguely Bourbon Street-esque exterior to a menu that, willy nilly, mixes cuisine categories with food items with Friday specials with – hey, no prices on anything? 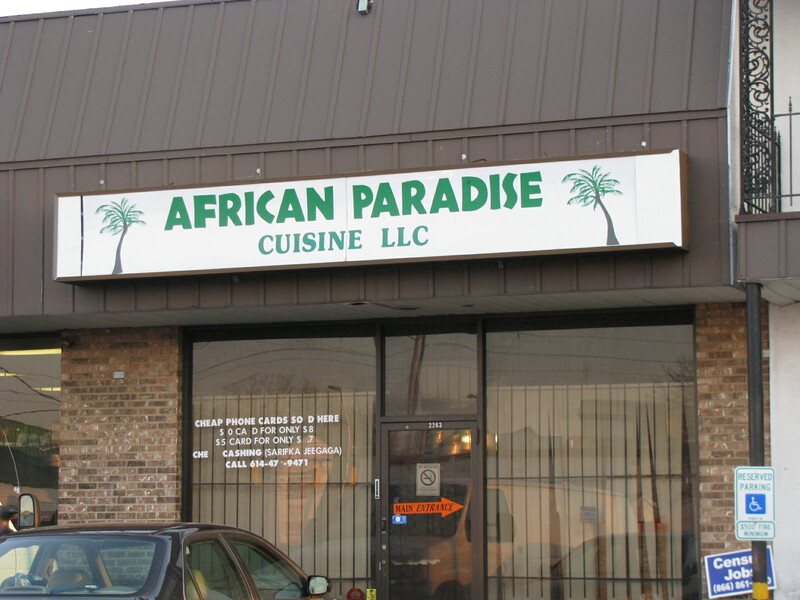 – much about this Somali restaurant will confound the more logically inclined. Do hang loose, though, because African Paradise has an awful lot to recommend it. Stepping inside, we found a large, clean space with minimal decor and low lighting. Our party of 5 was seated between a prayer room and a ‘ladies only’ room (a dining area sectioned off with accordion doors, presumably created to allow Muslim women to dine without the unwanted intrusion of the male gaze). 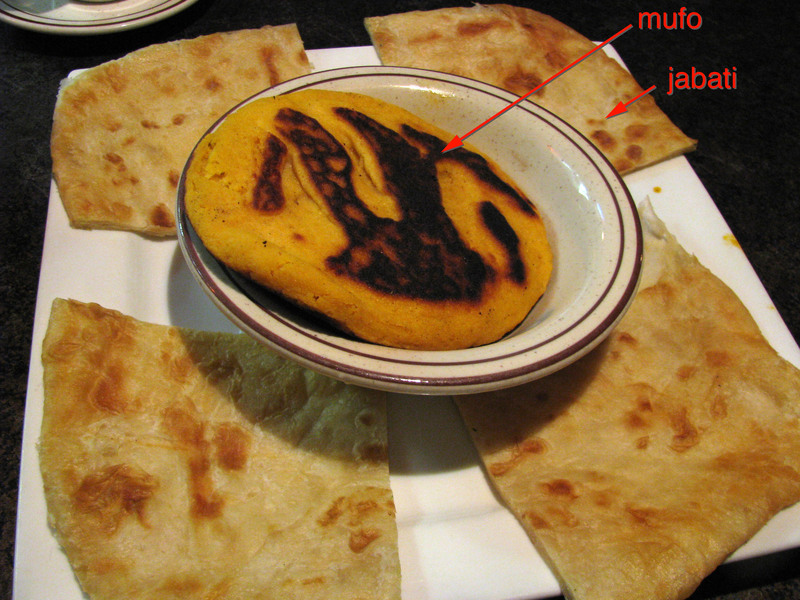 Turns out, mufo is a dense, tart and chewy cornmeal-based flatbread, while jabati is something like a wheat flour-based cousin to the Indian chapati. These were served with a delicious dipping sauce that Hungrywoolf described as tasting like a curried marinara*. ‘Did we like?’ asked the waiter. Indeed we did. With that, a proposition: ‘You can order single dishes for each person, or I can do a large family style dish for everyone with four different choices on it’. After much discussion, we settled on the family style spread and added rice, more jabati, soup, salad, mango juice, and Somali tea. All or some of which may or may not have come with the family style meal. Bottled water was also included. Soup and tea arrived first. The soup was a simple vegetable mix in a rich chicken broth, and was enjoyed by all. The Somali tea was reminiscent of chai with strong cardamom notes, but achingly sweet. That’s roasted goat, chicken, and two types of fish (salmon and, um, something else?) The goat was a revelation – while there was some variation between pieces, it was moist, tender, delicately flavored, and as good as any goat any of us had ever tasted. 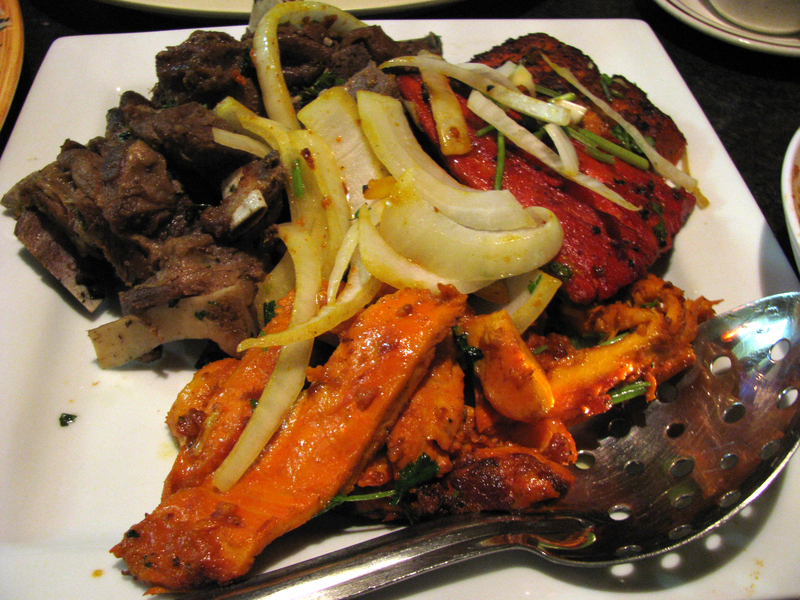 The chicken was reminiscent of an off-the-bone Indian tandoori, though in my opinion more flavorful and more tender. Both fishes were seasoned similarly to the chicken and were delicious though perhaps a bit on the dry side. The rice was subtle with just a hint of cardamom and made for a perfect accompaniment to the proteins. Quantities were generous – the photo with the oversized serving spoon fails to illustrate this point. The five of us indulged to our hearts content and had plenty of leftovers. Wait… you’ve got to be kidding. $33? For everything…. for all 5 of us?! Yeah, we’ll be back… especially since AP has some intriguing breakfast menu items. *The marinara analogy is interesting because Somalia was briefly colonized by Italy and Italian culinary influence persists to this day. Pasta items are not unusual in Somali restaurants and were in ample evidence on AP’s menu as well. This entry was posted in Somali and tagged African, goat, Somali, somalian. Bookmark the permalink. I think I want to try it but I think I will be nervous. 1. The no prices would make me nervous to begin with. 2. I have been intrigued by goat for a few years but I am not sure if I am up to trying it yet. 3. Confusion over how to order, family or individual always makes me a little nervous. Ordering at an Indian restaurant recently the waiter took care of us when I just tried to order “more of the same” rather than being adventurous. Your recommending alt.eats via Twitter made me laugh. I really liked their goat – and I’m not always a huge fan of it. I think it would be hard to spend more than $10 a person so you shouldn’t be too nervous about the prices and the staff were very helpful with suggestions on quantities and explaining the dishes. As hungrywoolf suggests, you really can’t overemphasize the kindness and generosity of the staff here. I couldn’t imagine anyone getting taken for a ride. Wouldn’t let that be a cause for nervousness. Regarding the goat – if ever there is a place to try it, this would be the one. I’d wager that you’ll leave wondering why anyone would find it to be a challenging flavor.